We had a surprise overnight stay in Boston last weekend. On Saturday, we drove Jasper to Logan airport for a spring break trip to Arizona to visit a friend. After that, we took Chris to dinner for his birthday at a spot near Fenway. The plan was to head home to Old Saybrook after that, but it turned out my body had other ideas. Near the end of our meal, I started feeling quite sick. I was going to head to the car to lay down but realized I wasn’t going to make it that far. I put my head down on the table to try and collect myself, and next thing I knew, I was waking up with Tim holding me. Much to my chagrin, I then proceeded to throw up all over his dinner plate (we left the waitress a very large tip). To try and make a long story short, we thought that I may have experienced another seizure. An ambulance came and the EMTs wanted me to get checked out given my recent neurosurgery, so they took me to the emergency department at Boston’s Brigham & Women’s hospital. But when blood tests were run and my mental status remained pretty much unchanged (i.e. no memory loss, confusion, or balance issues like I usually have during and following a seizure), the consensus was that I fainted because of dehydration and low blood pressure. The dehydration was likely due to the fact that I’ve had bathroom issues, nausea, and overall blechiness since last Monday. When you are stage IV, every ache, pain, and other discomfort immediately makes you think that a) the cancer is spreading or otherwise flaring up, and/or b) you are having side effects from treatment. This time it may have been the result of a garden-variety stomach bug, or what my friends with diabetes like to call being “real people sick” (i.e., sickness not related to their chronic illness). At any rate, the doctors wanted to keep me overnight for testing and observation, so I was moved to a single room with a recliner for Tim on their observation floor. They ran a slew of lab tests, a CT scan on my brain (just in case), and a cardiac stress test. One of the potential side effects of Herceptin and Perjeta, my immunotherapy treatments, is that they can cause heart damage, so they wanted to be sure that I hadn’t fainted due to an emerging heart issue. 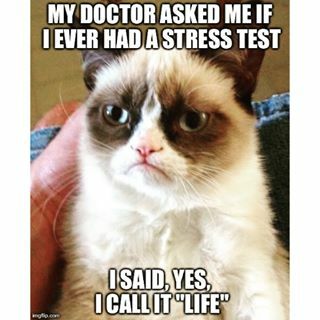 While some of my blood tests were a little off due to the dehydration, I passed the stress test without a problem. A few bags of fluid, some supplements, and lots of Zofran later, and Tim and I were finally on our way home late Sunday afternoon. Props to the capable and compassionate staff at Brigham and Women’s, who made sure we were both taken care of and comfortable. And the floor was blissfully quiet, such a rarity in hospitals but so important as it let me actually sleep the night I was there. I will definitely be giving them some love when the patient satisfaction survey comes in the mail. And even bigger props to Tim and Chris for helping this poor old lady out. Tim, I couldn’t get through this without you, and I’ll try to get us through the rest of the spring without you spending another night in a hospital recliner. And Chris, we owe you a proper birthday dinner. Coming up next week, I have a bone scan, CT scan of my body, and an echocardiogram (to follow up on the fainting incident). I’ll keep everyone posted on my progress. My motivation to write has been low lately, mainly due to the way I’ve been feeling, so I’d really like to shake this bug soon. Oh Paula, bless your heart. Like you don’t have enough to deal with? I sure hope you are feeling better soon! Second attempt at a reply. So glad that Brigham took good care of you both. Hoping that your “real people sick” goes away quickly, and you can enjoy some Spring sunshine on the deck. Much love coming your way. I hope you know how much we appreciate your “bulletins” and the deep empathy for the challenges of your journey. 👣one foot in front of the other. hang in there pal. FEEL BETTER SOON…LOVE YOU GUYS!!! Sending love to you and Tim. Hope you are getting some rest today. I’m glad it was ‘only’ what us ‘real people’ get and hopefully the bug is gone by now. Feel better! Very much appreciate you sharing your intimate details and journey with stage 4. Wish I could give you a hug in person so a virtual one will have to do. Love you! Love you. Hugs and kisses. Wishing you comfort. Sending you healing blessings.